When Margot (Michelle Williams – Blue Valentine), meets Daniel (Luke Kirby – The Samaritan) on a business trip, their chemistry is intense and immediate. Margot suppresses her sudden attraction as she is happily married to Lou (Seth Rogen – Green Hornet), a cookbook writer. When Margot learns that Daniel lives across the street from them, the certainty about her domestic life shatters. She and Daniel steal moments throughout the steaming Toronto summer, their eroticism heightened by their restraint. The most recent narrative feature from actress turned filmmaker Sarah Polley who was Oscar nominated for her multi-award winning previous feature Away From Her, Take This Waltz stars Michelle Williams (My Week with Marilyn, Shutter Island, Brokeback Mountain), Seth Rogen (Green Hornet, Knocked Up), Luke Kirby (The Samaritan, Tell Me You Love Me), and Sarah Silverman (The Sarah Silverman Program). The film was described by Screenjabber as "a flawed gem of a film," while The Guardian assured us that it "confirms Polley as a serious, intelligent talent." Worth a look, then. 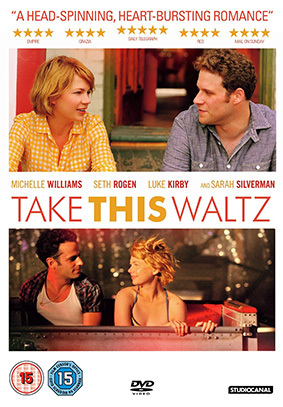 Take This Waltz will be released on UK DVD and Blu-ray by Studiocanal on 7th January 2013 at the RRP of £17.99.